Exploring the ideal laser energy parameters and potential dose-dependent effect. Micropulse transscleral cyclophotocoagulation (TSCPC) is a novel technique that uses repetitive micropulses of diode laser energy, delivered with the Cyclo G6 Glaucoma Laser System (Iridex), in an off-and-on cyclical fashion. It has been proposed that the off periods allow thermal dissipation, causing less collateral damage than traditional continuous-wave TSCPC.1,2 However, neither the exact mechanism of action (MOA) of micropulse TSCPC nor the ideal parameters for an optimal balance between efficacy and safety have been fully elucidated. This article reviews the available evidence to help approximate the ideal laser energy parameters to achieve the best balance of efficacy and safety and to further explore the evidence of a dose-dependent effect. The clinical impact of this modified surgical technique was shown in a study by Aquino et al6 that compared the efficacy and safety of micropulse TSCPC and continuous-beam TSCPC in a prospective cohort of 48 patients. In this study, 24 patients were treated with micropulse TSCPC and 24 with continuous-wave TSCPC. Success was defined as an IOP between 6 mm Hg and 21 mm Hg and at least a 30% decrease in IOP from baseline. At 18 months, the investigators found no statistically significant difference in efficacy between the groups (52% for micropulse TSCPC vs 30% for continuous-wave TSCPC; P = .13). They did, however, find a statistically significant difference in safety in favor of micropulse TSCPC (P = .01). Prolonged hypotony (IOP ≤ 5 mm Hg for more than 6 months) was observed in five eyes treated with continuous-wave TSCPC and no eyes treated with micropulse TSCPC. Visual acuity decreased by 9% (2/23) in the continuous-wave group and 4% (1/23) in the micropulse group. Uveoscleral outflow increase. In 1994, Liu et al8 observed an increase in uveoscleral outflow after continuous-wave Nd:YAG laser TSCPC. Recently, Barac et al3 published a study of 22 glaucomatous eyes treated with micropulse TSCPC in which choroidal thickness was measured using OCT. They found that patients who were successfully treated with micropulse TSCPC had an average increase in choroidal thickness of 16 mm at 6 months—from 369 mm at baseline to 385 mm after treatment. In contrast, patients who did not respond had no choroidal thickening after the intervention. Although this was an interesting finding, the series of cases was too small to show statistical significance. After these observations, the authors theorized that choroidal thickness variation may be the result of a rise in uveoscleral outflow after micropulse TSCPC. Figure 1. 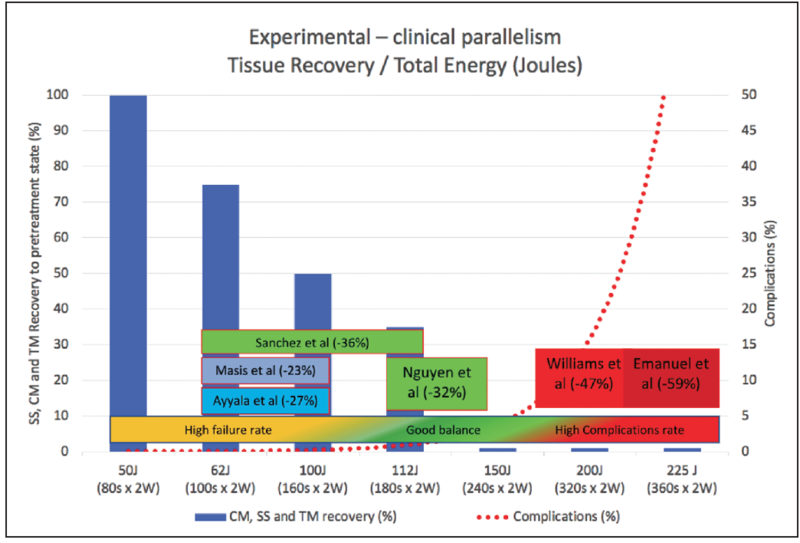 Blue bars represent an approximation of the progressively decreasing recoil/relaxation of the scleral spur, ciliary muscle, and trabecular meshwork with increasing energy levels observed in the experimental study by Johnstone et al.4 (Courtesy of Sanchez et al5). 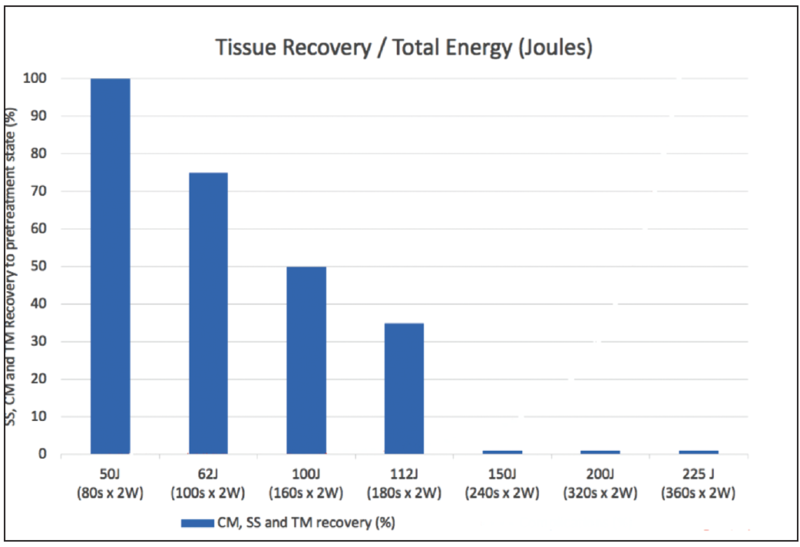 Sanchez et al5 searched the literature for all published clinical studies with micropulse laser and compared the energy settings used and outcomes with the experimental data of Johnstone et al. They found interesting coincidences, as described below. The findings of Johnstone et al4 may explain, to some extent, why the IOP-lowering effect of TSCPC seems to positively correlate with the amount of total energy applied. Based on these findings, Sanchez et al5 suggested that the experimental results published by Johnstone et al4 may allow further narrowing of the optimal laser energy levels. In that experimental study, the pilocarpine-like effect was maximum and permanent at around 150 J (2.35 J per probe location), roughly equivalent to a clinical setting of 240 s x 2 W x 0.313 duty cycle. Coincidently, the clinical studies that used similar energy levels—close to 150 J—obtained moderate IOP decreases of around 30% with few or no complications.9 Based on these data, Sanchez et al hypothesized that, with current surgical technique and commercially available probes, the ideal laser parameters for micropulse TSCPC might converge in a mid-range level, between 112 J and 150 J, with experimental data orienting to a point closer to 150 J (Figure 2). This is only an initial hypothesis based on the limited published literature so far, in which the authors found gross coincidences in the observed data. Figure 2. Experimental and clinical data overlap. The x-axis shows increasing energy levels in joules. The blue bars on the y-axis summarize the progressively lower recoil or relaxation of the scleral spur (SS), ciliary muscle (CM), and trabecular meshwork (TM) observed in the experimental study by Johnstone et al.4 Color boxes represent the studies that applied the corresponding treatment durations and the mean IOP lowering effect (%) obtained, respectively. The secondary axis represents clinical complications with increasing energy levels reported in the literature. The colored bar illustrates an evidence-based hypothesis of the best balance between efficacy and safety. (Courtesy of Sanchez et al5). It would be helpful to have a guideline, based on the potential dose-response effect, that proposes defined energy parameters while taking into account the individual characteristics of each patient. This could provide surgeons with greater certainty regarding the balance between efficacy and safety that might be expected, as well as the survival of the treatment’s effect. Depending on the scenario and available options, surgeons could opt for more or less aggressive treatments, commit to the possibility of having more or fewer side effects, and even choose a temporary duration of the IOP-lowering effect when necessary. Limitations. It should be noted that the observations regarding dose-response relationship for micropulse TSCPC are a gross estimate. Limitations are numerous, including difficulty interpreting the studies due to the different parameters used, possible variability in surgical technique used, and heterogeneity of the cohorts. 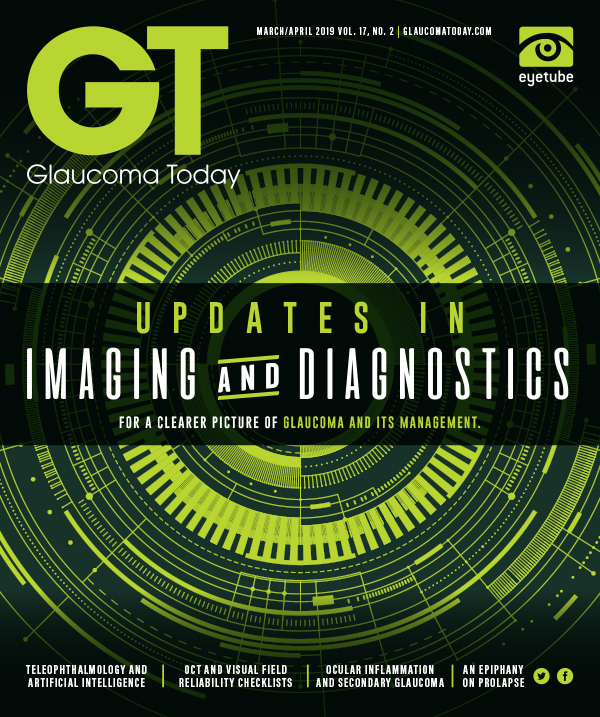 Individual characteristics such as pigmentation and type of glaucoma could have an impact on final outcomes. For example, some authors reported higher odds of prolonged inflammation in heavily pigmented eyes (OR, 3.61; 95% CI, 1.27–10.23; P = .02), which led them to suggest that it is reasonable to use shorter treatment durations in this population.10 In patients with congenital glaucoma or highly myopic eyes, anatomic variation may require further exploration (via ultrasound biomicroscopy analysis) to correctly place the probe over the target tissue. The presence of pseudoexfoliation may also hinder the treatment’s success. The literature yields the hypothesis that a dose-response effect for micropulse TSCPC might exist. According to Sanchez et al,5 with current technique and commercially available probes, the procedure appears to have a safe zone with a good balance between efficacy and safety in the 112–150 J range, and experimental data suggest a point close to 150 J. When this zone is exceeded, the ophthalmologist may obtain a greater reduction in IOP, but at the cost of more significant side effects. This hypothesis does not consider the individual characteristics of the patient, but it establishes a framework and a starting point to further refine the technique and individualize its application. Prospective studies are needed to corroborate this hypothesis, evaluate the MOA that prevails at different energy levels, and help create guidelines to determine ideal laser parameters on an individual basis. 1. Tan AM, Chockalingam M, Aquino MC, Lim ZI-L, See JL-S, Chew PTK. Micropulse transscleral diode laser cyclophotocoagulation in the treatment of refractory glaucoma. Clin Exp Ophthalmol. 2010;38(3):266-272. 2. Desmettre TJ, Mordon SR, Buzawa DM, Mainster MA. Micropulse and continuous wave diode retinal photocoagulation: visible and subvisible lesion parameters. Br J Ophthalmol. 2006;90(6):709-712. 3. Barac R, Vuzitas M, Balta F. Choroidal thickness increase after micropulse transscleral cyclophotocoagulation. Rom J Ophthalmol. 2018;62(2):144-148. 4. Johnstone MJ, Padilla S, Wen K, Wang R. Transcleral laser induces aqueous outflow pathway motion & reorganization. Paper presented at: 2017 American Glaucoma Society meeting; March 2-5, 2017; Coronado, CA. 5. Sanchez FG, Peirano-Bonomi JC, Grippo TM. Micropulse transscleral cyclophotocoagulation: a hypothesis for the ideal parameters. Med Hypothesis Discov Innov Ophthalmol. 2018;7(3):94-100. 6. Aquino MCD, Barton K, Tan AMWT, et al. Micropulse versus continuous wave transscleral diode cyclophotocoagulation in refractory glaucoma: a randomized exploratory study. Clin Exp Ophthalmol. 2015;43(1):40-46. 7. Samples JR, Knepper PA. Glaucoma Research and Clinical Advances: 2018 to 2020. Wayne, PA: Kugler Publications; 2018. 8. Liu GJ, Mizukawa A, Okisaka S. Mechanism of intraocular pressure decrease after contact transscleral continuous-wave Nd:YAG laser cyclophotocoagulation. Ophthalmic Res. 1994;26(2):65-79. 9. Sanchez FG, Lerner F, Sampaolesi J, et al. Efficacy and safety of micropulse transscleral cyclophotocoagulation in glaucoma. Arch Soc Esp Oftalmol. 2018;93(12):573-579. 10. Williams AL, Moster MR, Rahmatnejad K, et al. Clinical efficacy and safety profile of micropulse transscleral cyclophotocoagulation in refractory glaucoma. J Glaucoma. 2018;27(5):445-449. 11. Emanuel ME, Grover DS, Fellman RL, et al. Micropulse cyclophotocoagulation. J Glaucoma. 2017;26(8):726-729. 12. Quigley HA. Improved outcomes for transscleral cyclophotocoagulation through optimized treatment parameters. J Glaucoma. 2018;27(8):674-681.